I know some of you have been wondering about my classes and students. The courses are going quite well. At top is my Cold War class, at bottom is my World War II class. Some are in both classes but mostly they are two different groups. The students come from all over the country - UCLA, U. of Toledo, U. of Idaho, Cal-Poly, Nevada-Reno, Michigan State, Wright State, and others. These photos and others are going to be useful for my classes. At top is the Altar of Zeus taken from the Greek town of Pergamon. 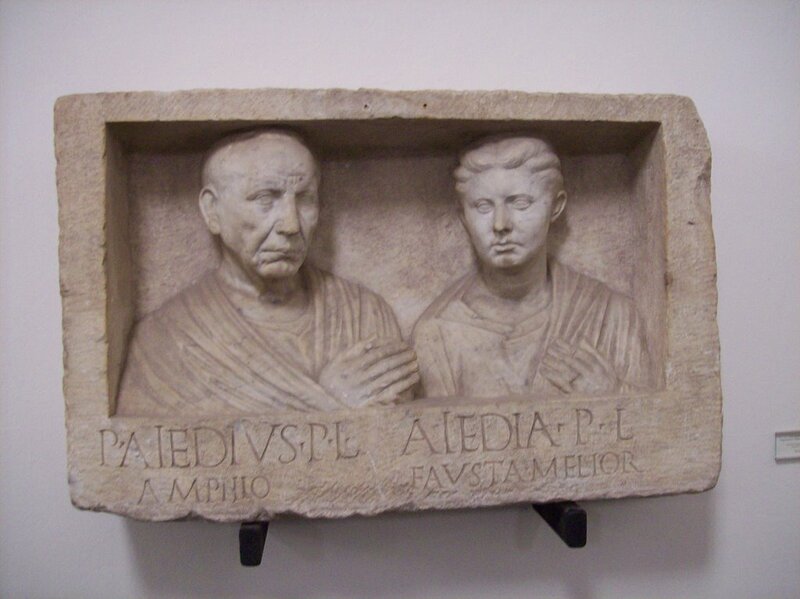 In the middle is actually a tombstone from a tomb along the Appian Way near Rome. Interestingly, the inscriptions say that had been slaves to won/bought their freedom and, clearly, they went on to become solid members of society. 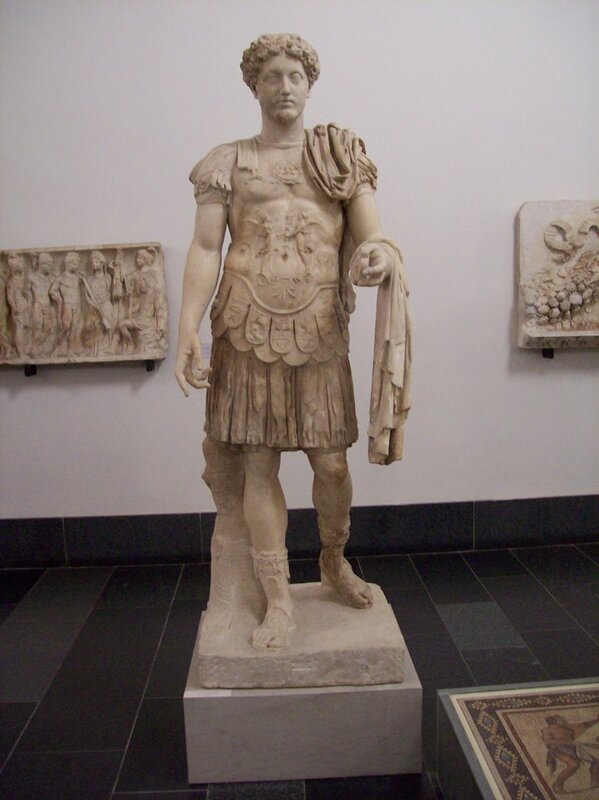 At bottom is a statue of a Roman soldier. I liked the kind of goofy expression on his face and the hand extended as though he was asking for a beer. I spent our Thanksgiving break in Berlin. 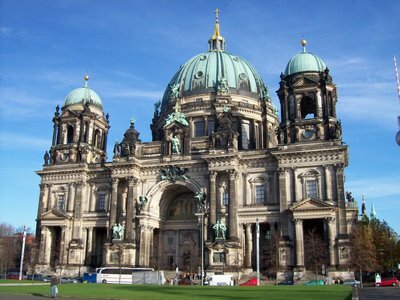 I have not been in the capital since 2000 when I made a couple of day trips from nearby Wittenberg. 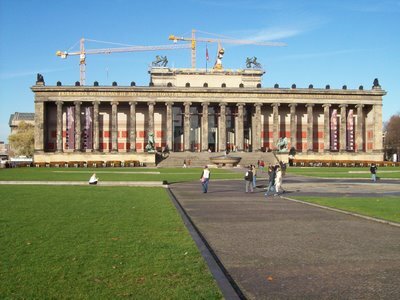 I stayed at a hostel in the “mitte” or middle section of Berlin which is actually in the former east Berlin. It was a rather upscale hostel, filled with students but also some more mature travelers. I had a nice single room on the sixth floor with my own tiny bathroom and shower. Even had maid service every other day. The place, an A&O Hostel, must be packed during the summer. 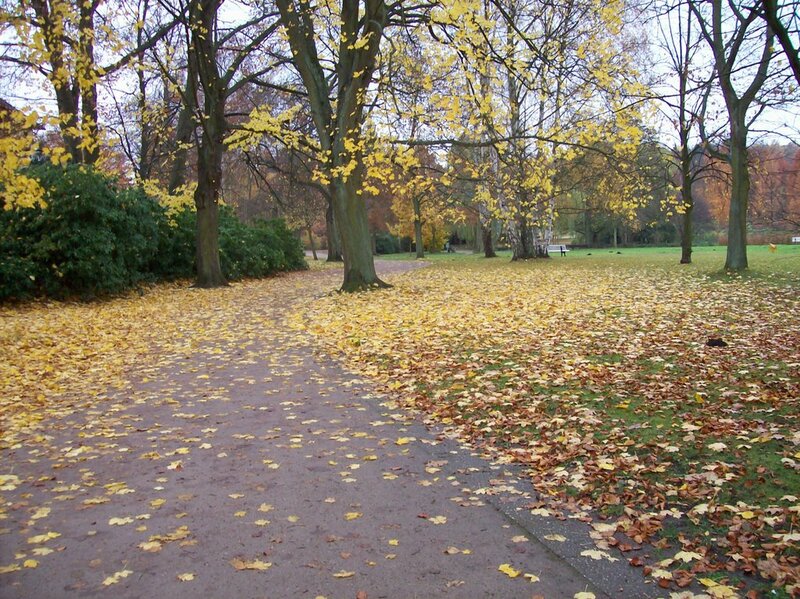 They also have branches in Prague and Hamburg. The afternoon I arrived, the weather was cold and rainy. Surprisingly, the next day dawned sunny and warm. I almost didn’t need my jacket. I went to the nearby subway stop, named after the famous German poet Heinrich Heine, and went off to Alexander Platz. 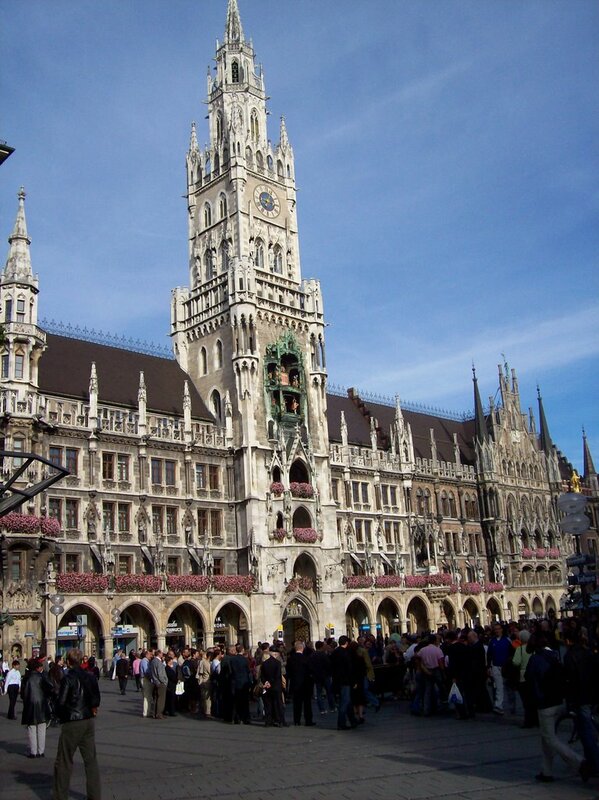 From there I walked past the Berlin Rathaus, known as the Red Rathaus because of its red brick construction. 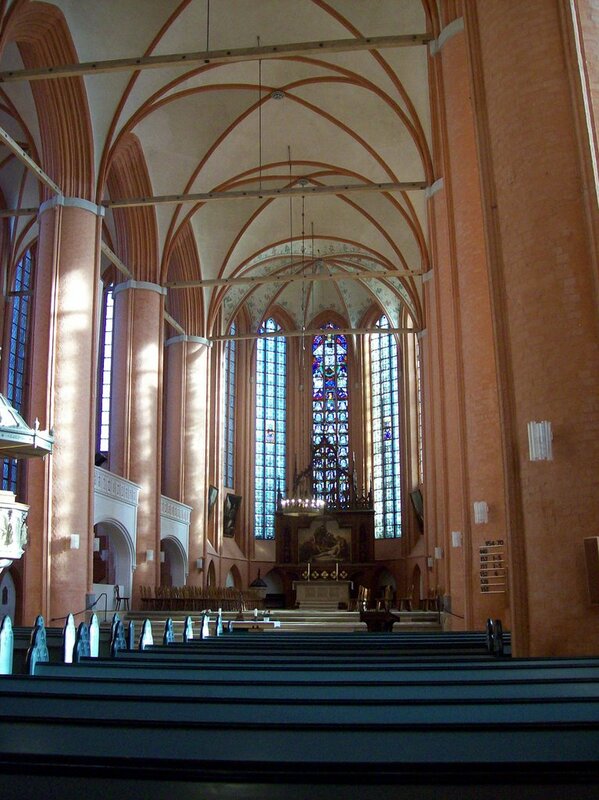 Nearby was an interesting church called Marienkirch which had largely survived the bombing and fighting during the war. From there I walked along to a small mall where I stopped at a coffee shop and had a cup at a sidewalk table in the warm sunshine. 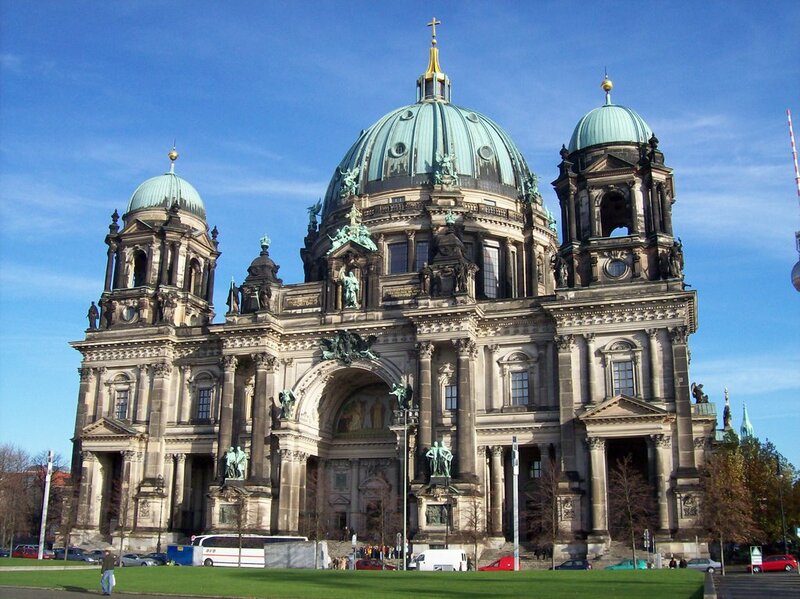 Then it was off to see the nearby Berliner Dom, a beautiful cathedral that my guidebook said is proof that Protestants, too, can build an extravagant place of worship. Instead of saints adorning the beautiful doorway, there are small statues of prominent figures of the Reformation. Above at bottom is a photo of the Dom along the River Spree which flows through the city. Next it was off to the city’s island on the Spree, known as the Museumsinsel, or museum island, a treasure trove of museums, After a sandwich and a pint of Berliner pilsner for lunch at a museum cafe, I decided to see the Alte Nationalgalerie, a musem of nineteenth century art (primarily German); and the Pergammon, a world-famous archaelogical museum. One of the important aspects of the Alte Nationalgalerie is that its main reason for being was to be an expression of German identity and German nationalism. While the Germans are an ancient people, the German state is only a creation of the mid-nineteenth century, a product of the nationalism that swept Europe after the Napoleonic conquests and of Otto von Bismarck’s military conquests between 1866 and 1871. 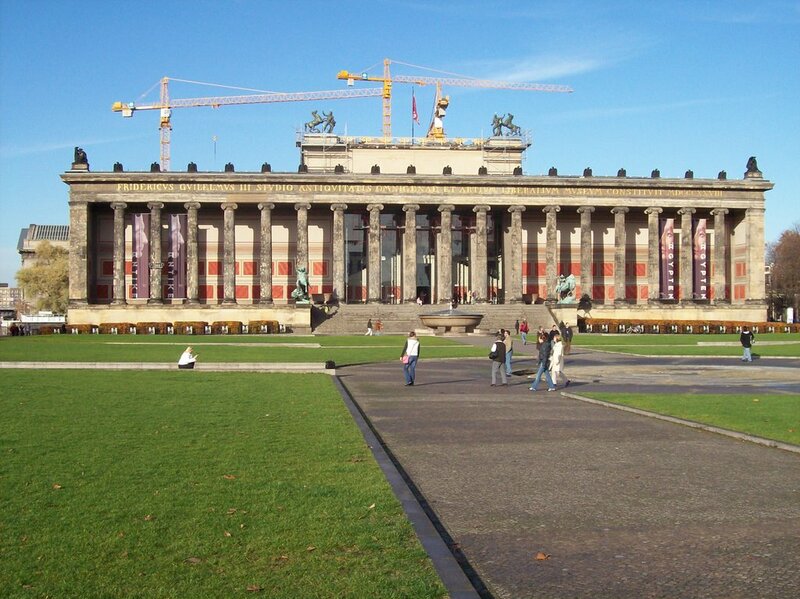 So the goal was to be a showplace of German art. It is a great collection. For me, one of the highlights is the famous painting of Prussia’s Frederick the Great, who was a musician as well as a military commander, playing the violin for his court. 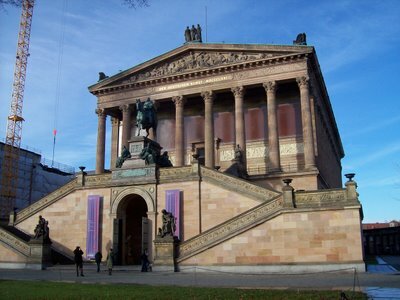 A photo of the Alte Nationalgalerie in above in the middle. 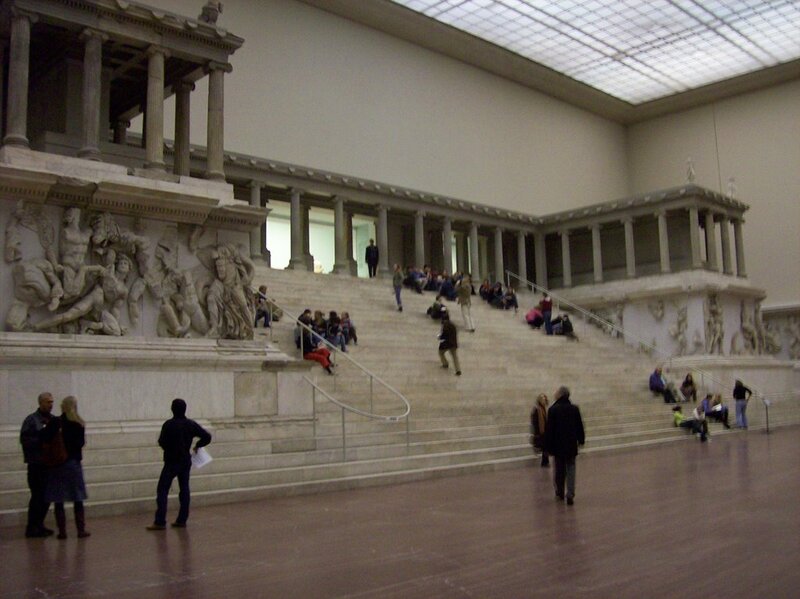 Next, it was on to the Pergamon. The museum gets its name from the huge temple that German archaelogists uncovered at the site of the ancient Greek town of Pergamon. 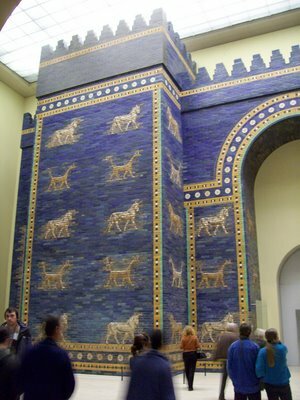 This Altar of Zeus, photo above, is the first thing one seems on walking into the musem. Spectacular. There are rooms and rooms full of Greek and Roman sculpture, even the famous Roman copy of a copy of a bust of Alexander the Great that appears in most books about Alex. 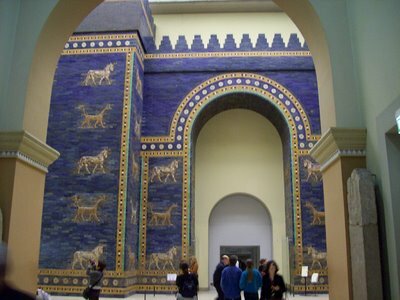 One floor of the museum focuses just on Islamic art, reaching back to the first caliphate and going on through the Ottomans. But the most impressive thing for me was Babylon’s Ishtar Gate. 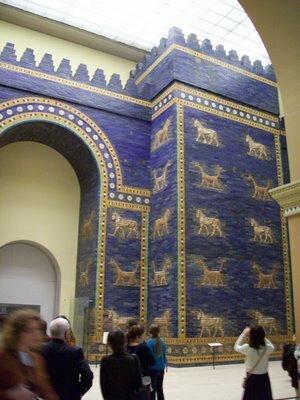 Taken brick by brick from the site of ancient Babylon, the gate was reconstructed in the museum. Large parts of it had to be created new because of missing pieces but nevertheless the gate stands inside the museum as you can see in the photo. Amazing. Photos can’t do it justice. At the top, is a shot of the Egyptian museum which I did not visit on this trip. People have different theories about how to travel in a foreign country. I know some people who take all kinds of safety precautions, and they are constantly on the eye for pickpockets and thieves and wear a money belt, etc., etc. Instead, I try to blend into the crowd. I’ve noticed that locals don’t take all these precautions, even though they often have backpacks and are very casually dressed, much like tourists. If they feel safe, why shouldn’t I? After all, I lived in North Philadelphia, where there is a lot of random violence, and South Philadelphia, where there was a mob hit two blocks away – clearly far more dangerous than any foreign city I have ever been in. So I dress casually and have a small backpack. I don’t have a money belt because that seems to me a sign posted that you are a tourist. And, I wear dark shoes. White or colorful sneakers also scream American. As I do in some American cities, I sometimes put my wallet in my front pocket but I note that I never see Europeans doing this. I think that over the years this strategy has worked quite well for me. I’m very pleased at the number of times I am asked for directions. I must look like I should know. London is the big European city that I have visited the most and it has happened to me there several times. Last summer, two guys from India stopped me near Covent Garden to ask for directions to Trafalgar Square and I was able to tell them. A number of years ago, as I was headed to the train station in Dublin, an older man asked me if I knew of a place for breakfast. It happened that I did and gave him directions. He looked at me peculiarly. “You’re not Irish,” he said, having heard my American voice. I defended myself that I was mostly Irish by descent. It turns out he was from Galway and had never been to Dublin before. So on his first trip to Dublin, he asked an American for directions. We laughed. Most recently, I was at a subway stop in Munich waiting for a train when a businessman walked up to me and asked on which side of the platform would a train take him to a certain village outside of Munich. My Deutsch is just good enough that I could understand the question but I didn’t know the answer and didn’t have enough vocabulary to help him. All I could say was “Ich spreche kein Deutsch. Tut mir Leid.” He responded good-naturedly and went on to someone else. Last weekend in Berlin, I had a few interesting brief encounters. Two older women were looking for the location of a restaurant that was near Alexanderplatz. Although we could not really talk to each other, I showed them on my map where they needed to go. Also, as a promotion, a couple of guys were giving away newspapers at one of the subway stations. I tried to tell him that I didn’t want one, with “Nein, danke.” But he persisted since they were trying to figure out what newspapers people were reading. So I had to say that I didn’t really speak German in German. He smiled, “Ah so (yes, the Germans say this quite often), you are a tourist?” Of course, the simple response was to say yes so I did. “Here,” he said happily in a heavy German accent, “for you” as he thrust the paper into my hands without further questions. It seemed like it was his way to welcome me to the city. Then another day, I was just getting ready to put money in the machine for a subway pass, when a guy getting off a train thrust a ticket into my hands. I couldn’t understand what he was saying but, with suitcase in hand, he smiled at me with generosity and bounded up the stairs as I said “Danke!” I looked at the ticket. It was a short-term pass, which mean it was good for two hours and had only been purchased about 15 minutes earlier. Clearly, he had just arrived back home in Berlin, took the subway to his neighborhood stop, and wanted to have someone else make use of the rest of the ticket. So I did. The generosity of strangers. And in Lueneburg a few weeks ago I had one of the strangest such encounters. I only have a few phrases of German and while they are very useful, they are very limited. I was in the internet café at the train station and was at the counter to get my complimentary cup of coffee when a maintenance man walked in. He said something about the weather, I said it was very nice. He heard me order coffee. We exchanged a couple of more of my standard phrases, I ran out of vocabulary and couldn’t understand or respond and thought he said something about America. So in desperation and having used up all my German, I said a couple of sentences in English and he responded in broken English. Finally, he said, “You speak very good English.” I laughed and said that I had better since it was the only language I knew and that I was born in America. We might have gone on with this but he got called back to work outside. I don’t really know what to make of this except that sometimes Germans from different parts of the country have difficulty understanding each other. Perhaps in our brief exchange I was actually mistaken for a German, which, if true, would mean that I have reached substantial success in my efforts to “blend in.” Or perhaps I just misunderstood him! Here is a more recent view of Kurpark on my way to the university. 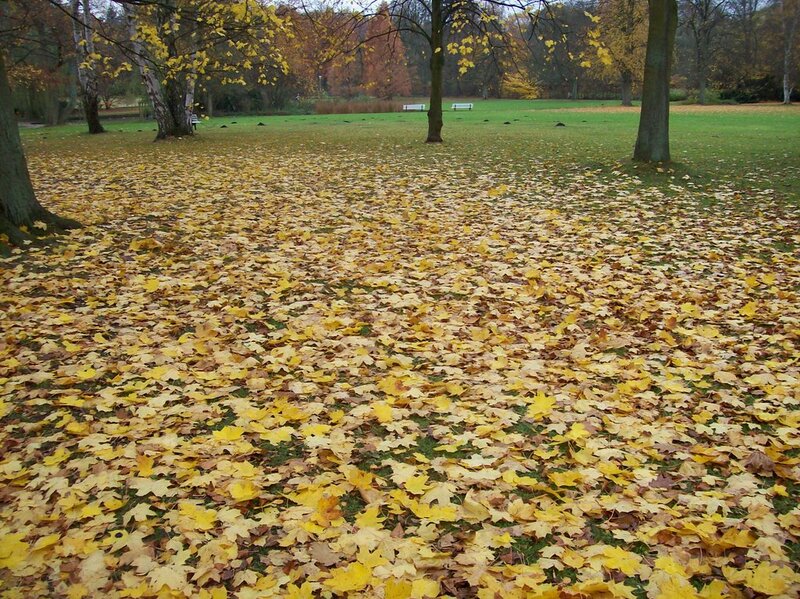 As you can see, it is a very different scene than summer. Actually, these photos are from a couple of weeks ago. 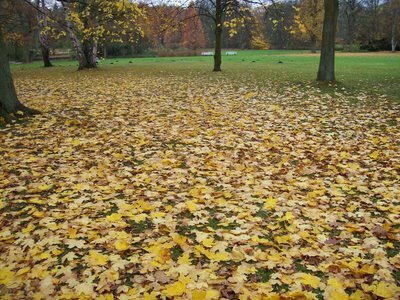 All the leaves are now down and we have mostly bare trees around town. It is hard for those of us who have gotten to know Lueneburg over the last few months to understand that it, too, was caught up in the horror of the Third Reich. In fact, there was quite a bit of Nazi activity in the city. Last week, I organized a walking tour for my students about the Nazi history of Lueneburg. 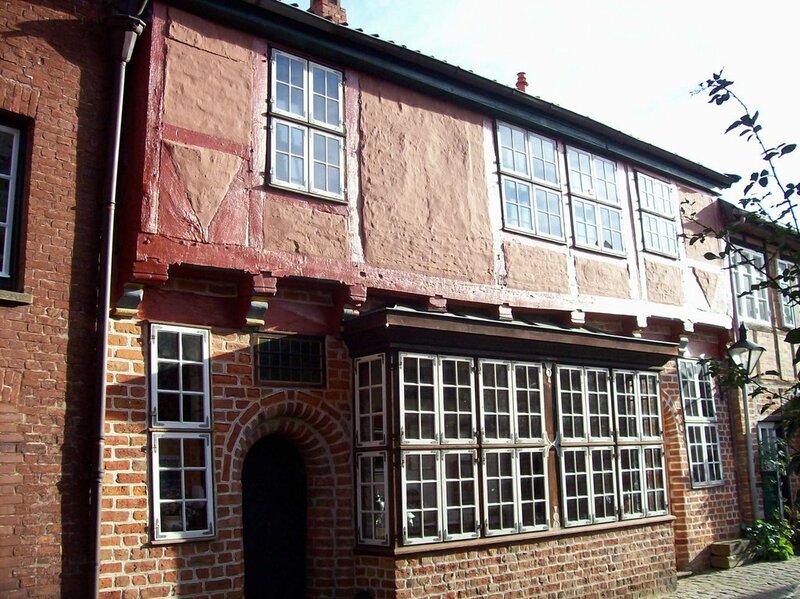 This is a subject not focused on by the local tourism effort which understandably prefers to focus on the city’s colorful Hanseatic history during the medieval and renaissance eras. But the Nazi tour fit in well with my WWII course and proved popular as several students signed up who are not even in my courses. The organizers of the Nazi tour are a private group of volunteers, who do receive some small funding from the city, and feel that activities of the National Socialists in Lueneburg is knowledge that should be more widely held. Their group is called Geschichtswerkstatt, which translates to The History Workshop. Our guides were Jurgen and Angela. They broke the group into two parts of about a dozen people each. The tours were slightly different, due to the interests and specialties of our two guides. I won’t give a blow by blow account of the walk but will focus on a few of the highlights. 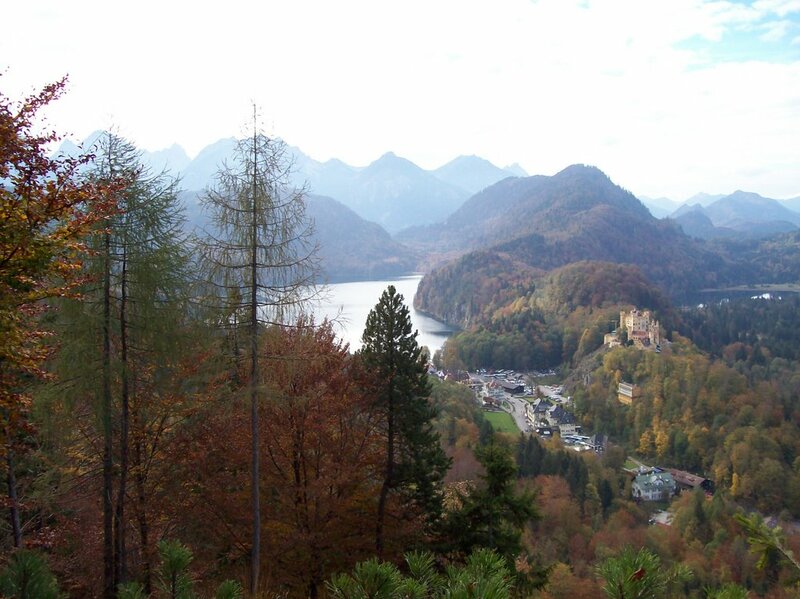 We saw several places that saw operations of the Brownshirts, or Hitler’s paramilitary group. One of the first places they hit in the city was the building where the unions headquartered. They attacked the building, ransacked it, and made it into offices for the Nazis. Labor unions were a typical target of the Nazis because of their potential for mobilizing resistance. We saw three stores that were once owned by Jews that were targeted by the Nazis. They were surrounded by Brownshirts who prevented customers from entering. Two of them were eventually ransacked by them. One of them, a shoe store, was “Ariyanized” or purchased by a non-Jew. In the sidewalks in front of some of the places that used to be Jewish businesses there are little plaques called “stumble stones.” They record the business owner and when the individuals were “deported.” Sometimes this was to the United States (as in the shoe store owners) or elsewhere. Sometimes it was to the concentration camps. Lueneburg holds an interesting position in this regard because of its proximity to Bergen-Belsen, where Anne Frank died. Bergen-Belsen through most of the war was a POW camp filled with Soviet soldiers. Many thousands of them died there of disease, starvation, and overwork. Not until toward the end of the war did it become a destination for Jews. In total, about 100,000 people died at Bergen-Belsen. During the Nazi reign, there was a political realignment that affected Lueneburg. 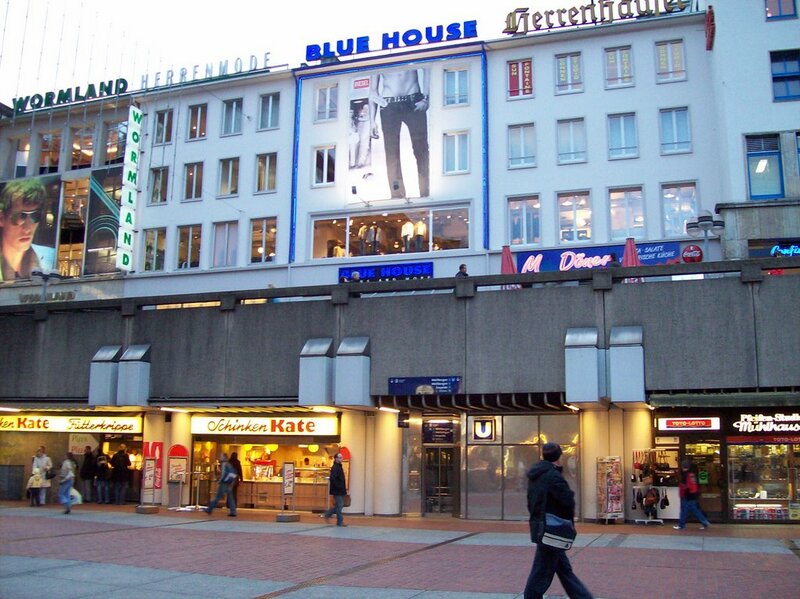 Hamburg had long been independent politically, sort of like a German “Lande” which is sort of like an American state. But under the Nazis, Hamburg-Harburg, just outside of Hamburg, was included under Hamburg’s political control. Hamburg-Harburg had been the region that included Lueneburg. 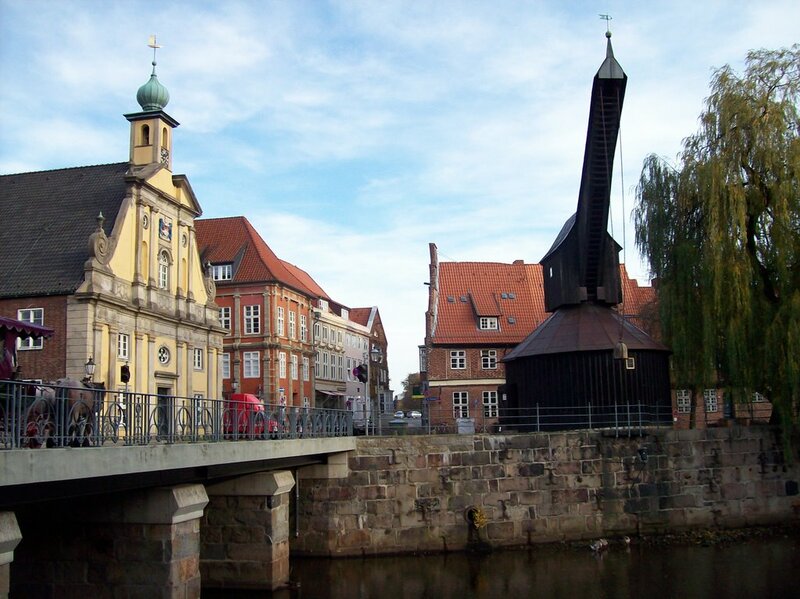 Now the Nazis chose Lueneburg to be the regional capital. 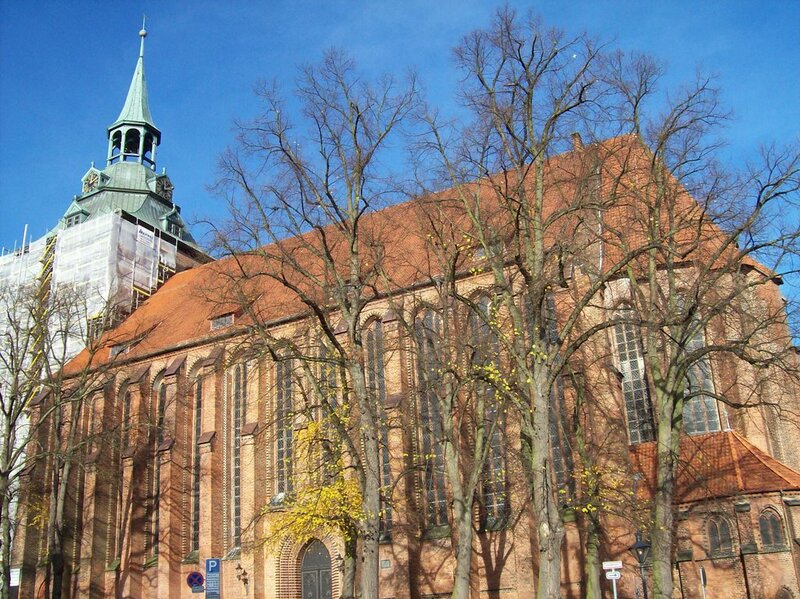 The impact of this decision was that the Nazis really wanted to put their mark on Lueneburg. Nazi architects drew up plans to create an area of grand buildings and broad avenues on the northside of the city. Fortunately, the war intervened and these plans were never put into place since it would have destroyed the amazing historical integrity of the town. 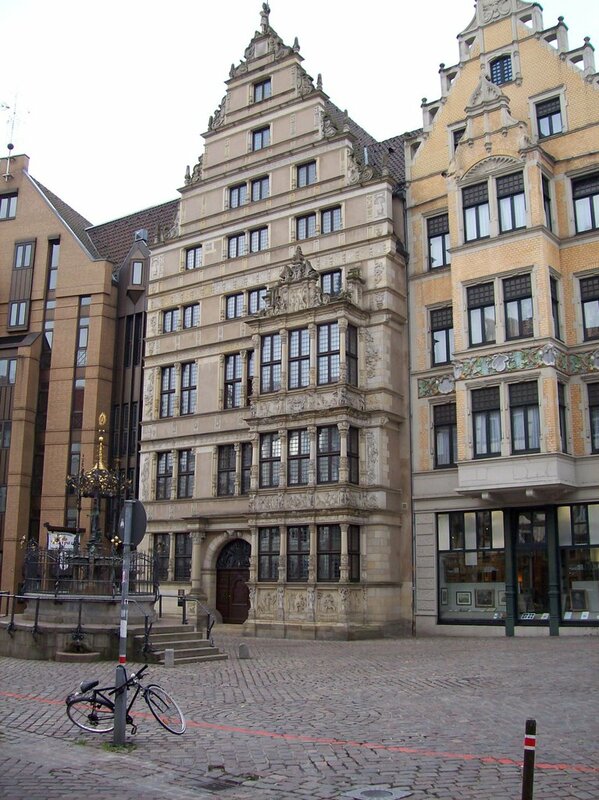 While the Nazis took over many buildings, including a prominent building on Am Sande, one of the main squares, as their headquarters, they built only one building in Lueneburg. 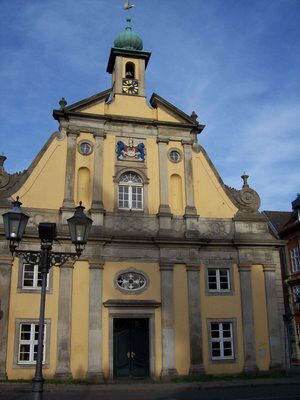 Completed in 1938, it is called Handwerkskammer. Ironically, its real historical importance comes from the end of the war. As British troops moved into the area, British commander, Field Marshall Bernard Law Montgomery, chose the building as his headquarters. 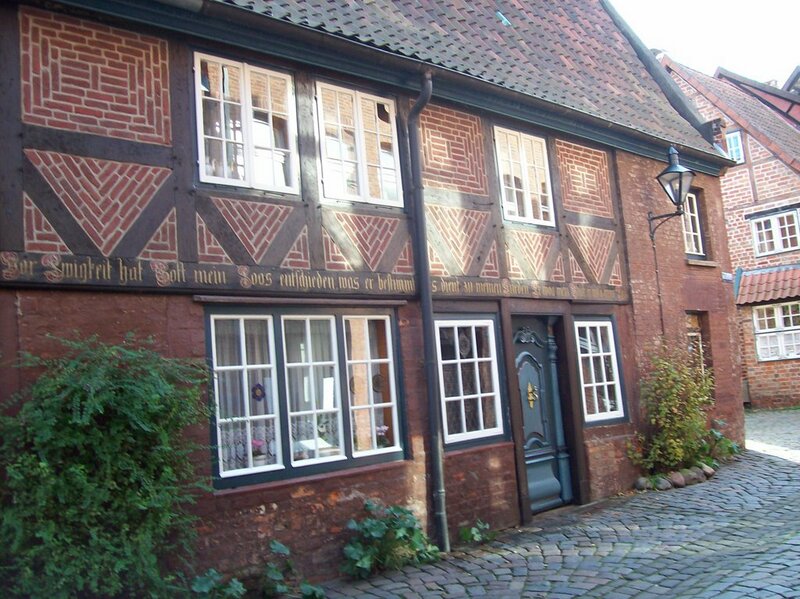 It was here in Lueneburg that German military commanders came to arrange for the surrender of Northern Germany and the occupied territories of Denmark and the Netherlands. 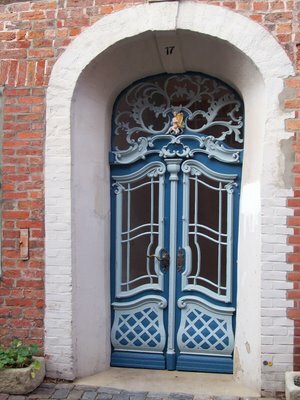 The actual signing took place elsewhere but it was arranged for in talks at Monty's British headquarter's in Lueneburg. Two other issues make Lueneburg important to the war. After the peace treaty was signed, the first war crimes trial was held in a building in Lueneburg, a building that sadly fell to a wrecking ball a few years ago, and the guards from Bergen-Belsen were tried. Interestingly, a man from Scotland took part in the tour with us. His grandfather was one of the military lawyers who represented the accused guards. 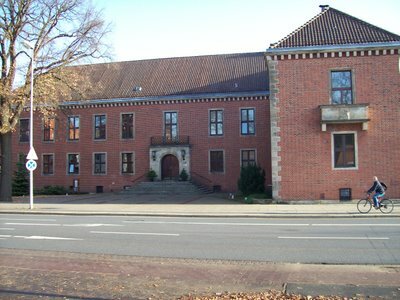 Above, is a photo of the only building in Lueneburg built by and for the National Socialists and was part of the larger plan that, fortunately was never built. It is interesting to see the balcony and what kind of speeches might have been planned to be given from it. 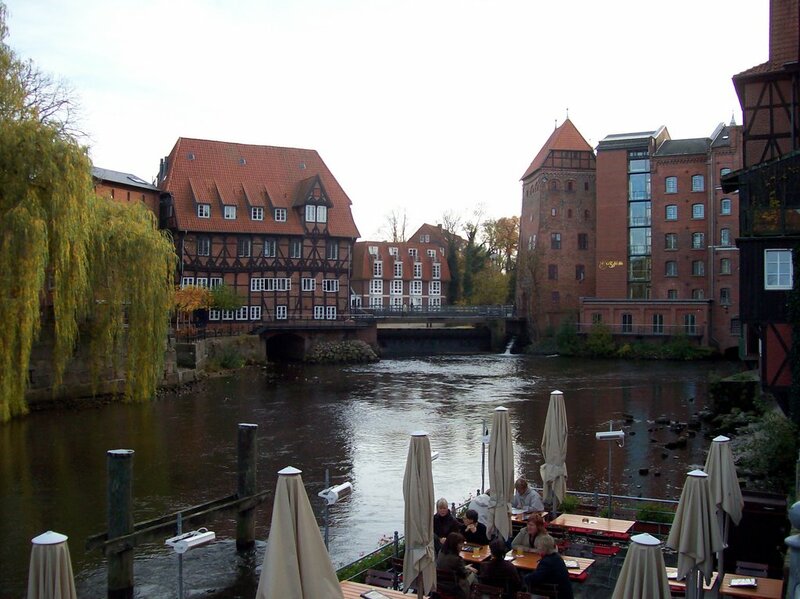 At the heart of Lueneburg's medieval prosperity is being able to ship out on water its precious commodity of salt. In one of the oldest parts of the city, several early port buildings and facilities remain. At this point, part of the Ilmenau river is diverted through the city to provide for the harbor. At top above is the medieval crane, a crane that has become a recognizable symbol of Lueneburg in much the same way that the Roebling bridge is a symbol of Cincinnati, or the mine headframes are a symbol of Butte, or the smokestack a symbol of Anaconda. It would lift pallets of salt off the shore and onto waiting boats. Behind it and in fuller view at bottom is an old salt warehouse. An interesting touch that does not come through in the photo is that the weather vane is a symbol of the boats that used to ply these waters. The photo in the middle shows other buildings lining the waterfront, most of which date to the medieval or renaissance era. The larger building on the left, for example, was building that held the offices of many who were tied to the salt business. In the foreground, you can see tables from a restaurant. Restaurants and bars or kniepen now line the quayside where sailors once walked. 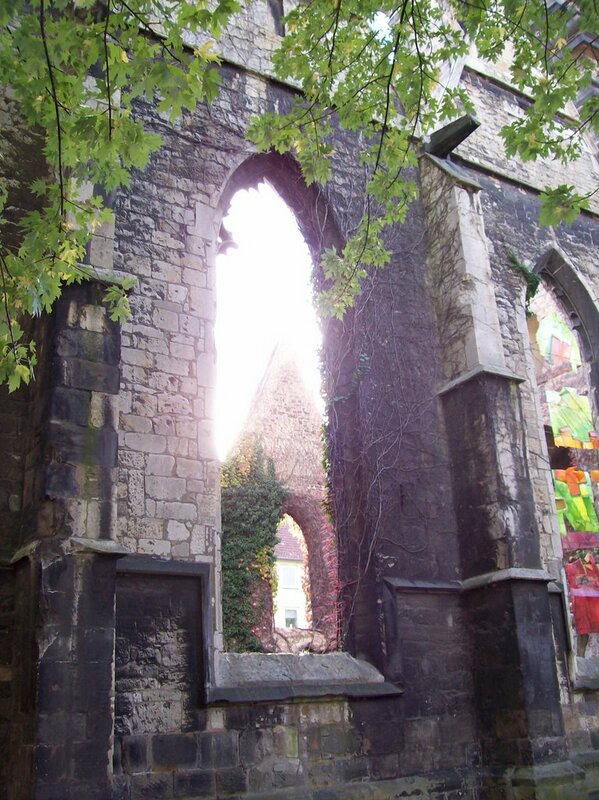 Nearby is the church of St. Nickolai, known as the sailors's church. 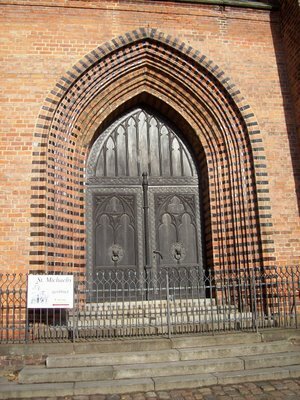 In the narrow streets around St. Michaelis Church are some narrow cobblestone streets filled with medieval or renaissance era homes. Many homeowners have invested a great deal of money in them. Many are tilting this way and that because of the subsidence problem in the area. Some have been refaced and reroofed but there are careful rules to guarantee the historical integrity of the neighborhood. The oldest parts of St. Michael's Church in Lueneburg date back to the 1200s, perhaps a bit further. The Benedictine monks and nuns who founded the place are first mentioned in a degree from the Holy Roman Emperor, Otto I, in 956 a.d. In the document, Otto determines that the monks have the right to mine the salt at Lueneburg. 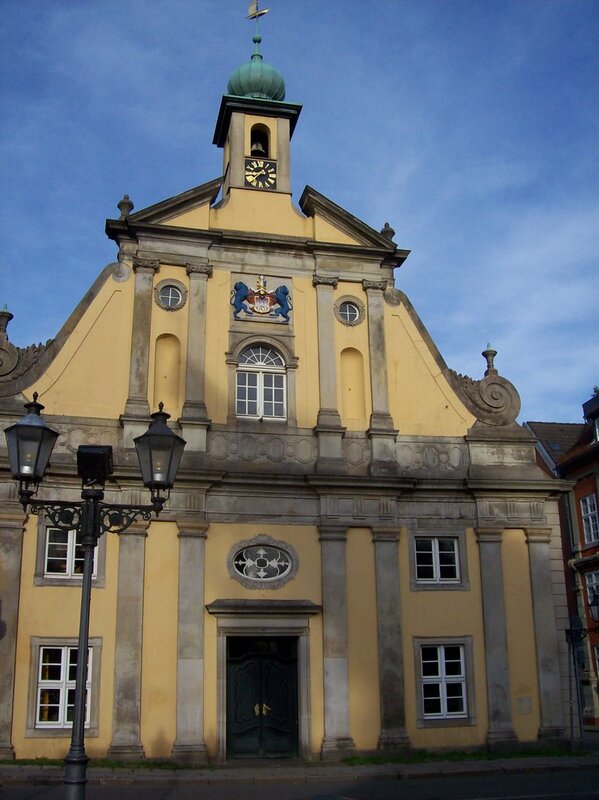 Johann Sebastian Bach sang in the choir here for two years. 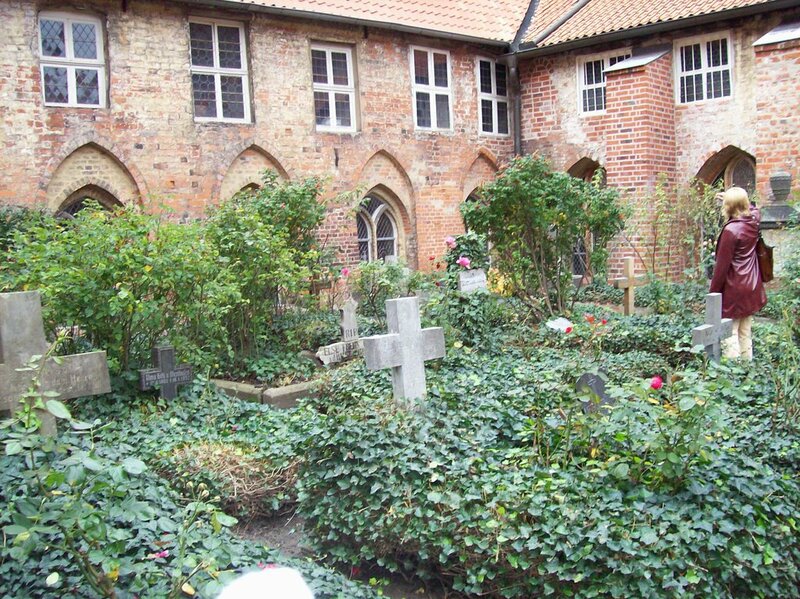 There is a cloister just outside of Luneburg that was built in the mid-1300s. 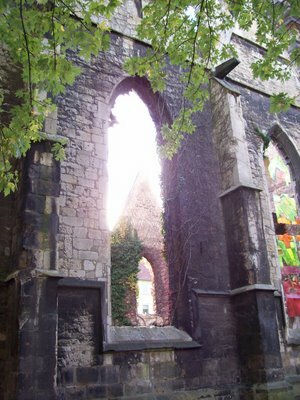 A cloister was not a convent but was for young women who might be prospects for becoming a nun. The great thing about the place is that it is not only largely intact from medieval times but is also currently being used today. 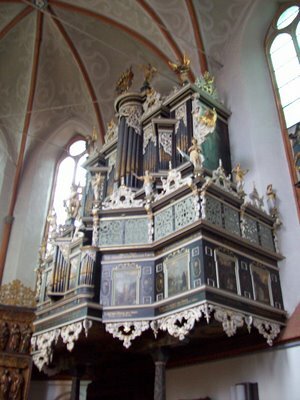 It is no longer Catholic, of course (because of the Reformation), but Lutheran. The woman who gave us our tour was perhaps in her late 60s and had decided recently to commit her life to the cloister and spend the rest of her life in service to the community of women who now live at the cloister. At the top of my photos above is a building that was built for the potential visit of a Hannoverian king (he died before it was finished). 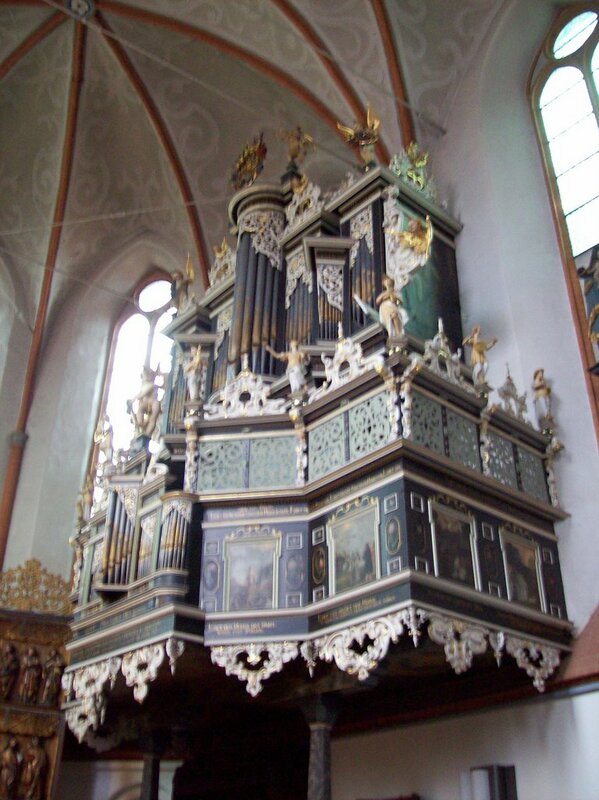 In the middle is organ in the cloister's beautiful chapel. At the bottom is the graveyard of women who have lived and died at the cloister. There is an odd thing about listening to the radio here in Germany. None of the radio stations seem strong enough to maintain a signal. When I walk with my Walkman, there are a lot of stations but they just slip away as you walk. I have a radio stereo in my apartment but it doesn't get good reception and thus I can pick up only two stations. But my Walkman at night at home is great. On both AM and FM, there are a lot of stations. Also, at night, one can pick up the BBC in English and AFN, or American Armed Forces Network radio. The BBC news and discussion programs are always good. I once heard a discussion of modern architecture from London that spoke about the importance of the contemporary art museum building in Cincinnati. AFN can be depended on for some good American music and they carry AP network news on the hour. All of us, in fact, have been impressed by the fact that most of the music one hears in Germany is either British or America pop music in English. I've asked a couple of Germans about this and they tell me that Germans like the sound of English and it doesn't matter that much if they can't always follow the lyrics. I have cable at the apartment which gets me a lot of German television and there is one program in particular in which people compete in karaoke. But it is karaoke in English! You can tell that the performers have practiced a lot so that as they sing they sound like native speakers of English but then immediately afterward they are back in Deutsch. On one program part of the competition is to sing a song impromptu and then you can tell sometimes that they actually know very little English. 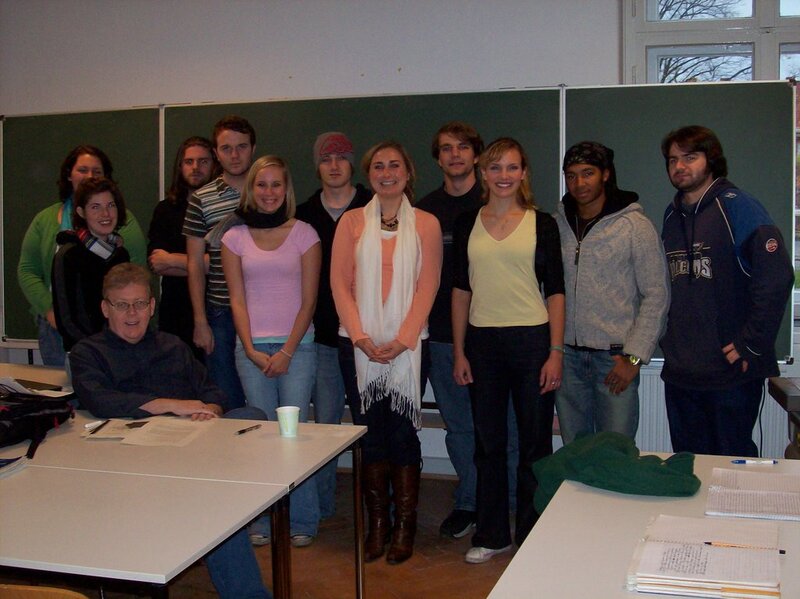 One great thing about my experience in Germany has been the willingness of Germans to speak English if you need help. And they don't seem offended by an American's stumbling attempts to speak German. I traveled to Hannover a few days ago. Because of being largely destroyed during the war, there are large stretches of new pedestrian walking areas with lots of new shops and wide straight sidewalks. It was quite busy later in the day. 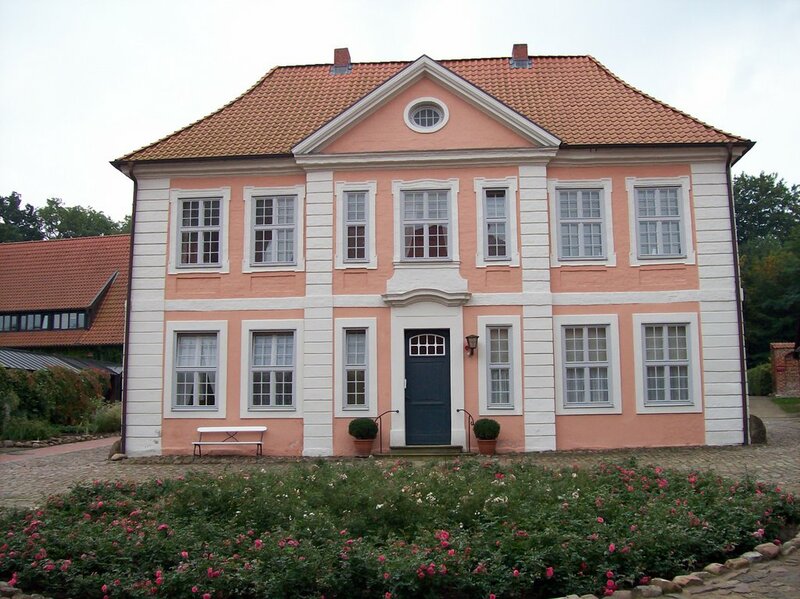 They have an interesting museum about the royalty family based in Hannover. The British royal family are Hannoverians and ruled over part of Germany as well as Britain until the reign of Queen Victoria. At the top is a scene from the walk from the train station into the city center. Part of the street and many of the shops are underground. this is a photo looking up from the lower level to the street level shops. 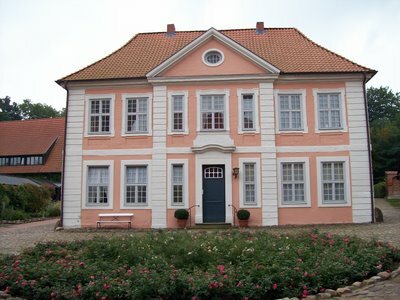 In the middle is Gottfriend Leibnitz's home. A contemporary and peer of Isaac Newton, he was an important German mathematician, philospher, and scientist. At the bottom is Mariankirch, a church that was destroyed by bombing during the war. In what is left of the steeple is a large peace bell donated to the church by the city of Hiroshima. 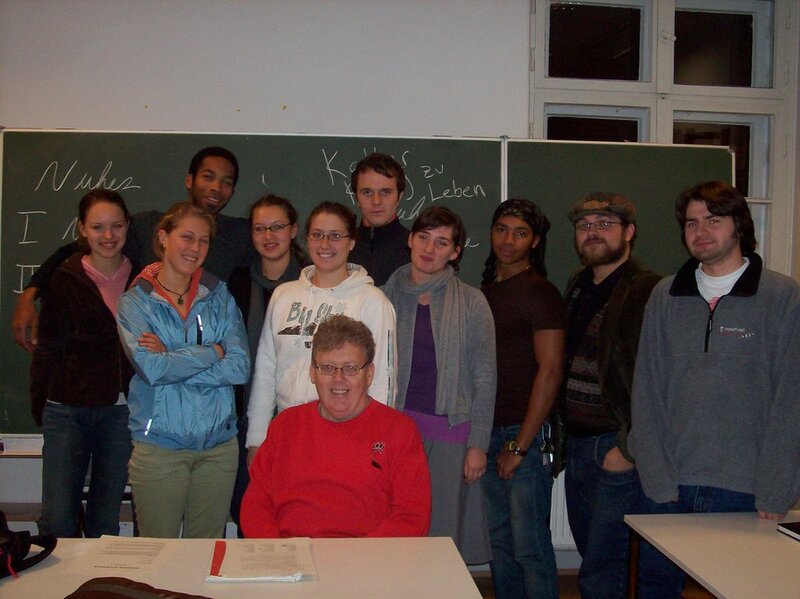 Most of the students and I have been glued to our laptops watching the election from Germany. Those who are politically-inclined are as enthusiastic about the sweeping Democratic victory as I am. It is not so much what the Dems will be able to do now, since things are in such difficult straits, but that they will be able to apply the brakes to some of the more foolish and dangerous neo-conservative policies the Bush administration has adopted. 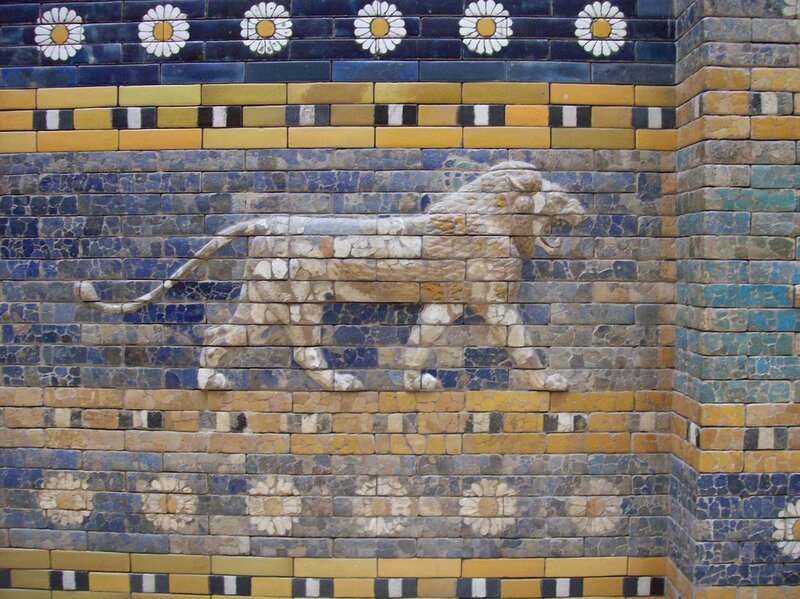 Germans who I have talked with are hoping that this will mean that a healing process can begin between the United States and Europe, and Germany in particular since Germany was one of the most outspoken opponents of the war in Iraq. While some clearly seem to be enjoying Bush getting a "thumping," most are just hopeful for more responsible behavior from the United States. It is like the US is a dear friend who has been engaged in self-destructive behavior but is now on the road to recovery once again. I am taking special pleasure in the important role Montana has played in taking back the Senate. My refrain of "So goes Montana, so goes the nation," has brought some chuckles from my students. I've also provided a little Montana history lesson for those see Montana as a longtime Republican bastion. This is not the first time Montana will have two Democratic Senators. In the 1960s, Mike Mansfield and Lee Metcalf led the Dems and then John Melcher replaced Metcalf, Baucus replaced Mansfield, and this continued until 1988 when Burns won to be the first Republican Senator in many years. So actually, Montana has been traditionally Democratic leaning, not Republican. If you would like to read some German reaction to the election, check out Spiegel International online. Their headline today was "George W. Who?" I have had trouble with adding photos to my posts which explains the gap in my posting. 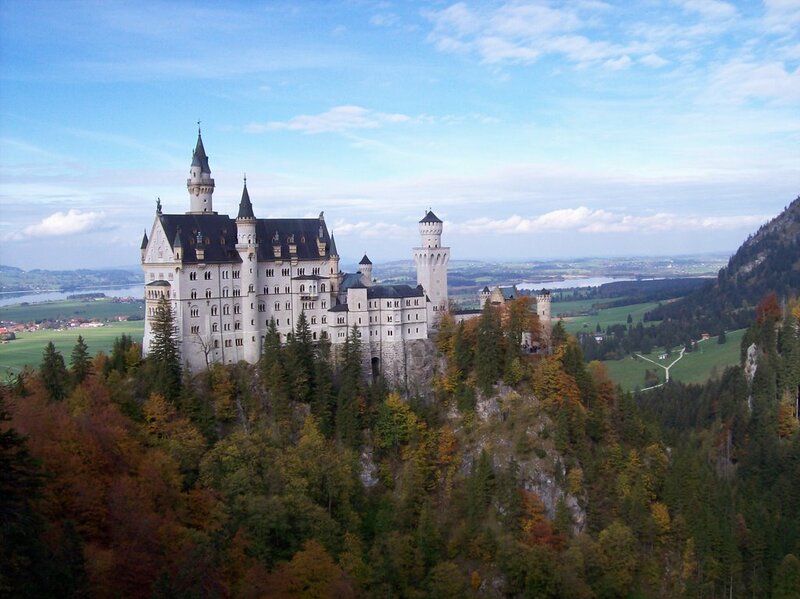 At top is the castle of Neuschwanstein, built by Mad King Ludwig II in the nineteenth century. In the middle is a view from the path walking up to the castle and you can see more Alps in the background and another castle. 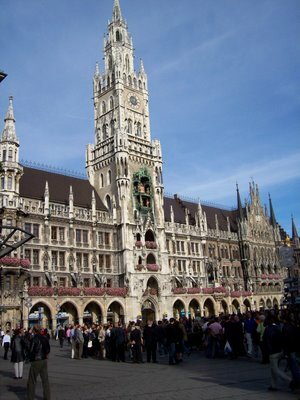 At bottom is the Rathouse in Munich. Lots of people and not far from the Hofbrauhaus.